Halfway through exposure I put a candle in front of it. Just playing around with the camera this evening, since it is raining and nothing is really on TV. There are more photos on the flickr site. 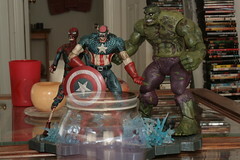 This entry was posted in Flickr Picks, Photography and tagged flickr, Photography, super-heroes, zombies by Ron Bieber. Bookmark the permalink.